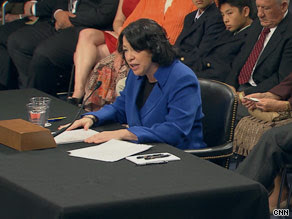 Today began the confirmation hearings of the U.S. Supreme Court nominee Sonia Sotomayer. Actually, she may have a 90% for - 10% against - chance of winning her nomination, but Sonia Sotomayer is determined to keep what she calls her judicial philosophy. She says, " It is simple: fidelity to the law. The task of a judge is not to make law, it is to apply the law. And it is clear, I believe, that my record...reflects my rigorous commitment to interpreting statutes according to their terms and Congress's intent and hewing faithfully to precedents established by the Supreme Court and by my Circuit Court. In each case I have heard, I have applied the law to the facts at hand." It is also interesting to note that the people that mostly criticized her in their opening statements were Republicans, and the ones to praise her for her actions as a circuit court judge were Democrats. This will obviously be a big win for Barack Obama as he nominated her to become a Supreme court justice. She will be one of eight justices to serve with the Chief Justice of the United States, John G. Roberts Jr. who was elected to that office since September 29, 2005 by George W. Bush. The position as a judge in the Supreme court would mean a lifetime commitment to that position as the term length of a Supreme Court judge is life tenure. She will be one of eight members of the Court and they are officially Associate Justices of the Supreme Court of the United States, not "Associate Justices of the United States." In fact, the Chief Justice is the only member of the Court to whom the Constitution refers as a "Justice," and only in Article I. Article III of the Constitution refers to all members of the Supreme Court (and of other federal courts) simply as "Judges. "It is interesting to note that the salary of a supreme court justice John G Roberts, Jr.is $217,400 per year.